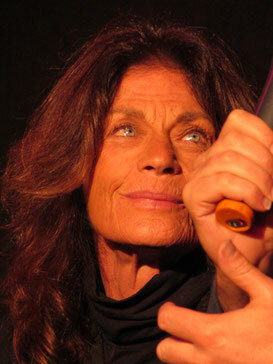 This article is about meeting the actress with the most beautiful eyes in Hollywood: Meg Foster. Whenever I saw Meg Foster on screen I found her eyes quite intimidating and scary (maybe it’s because of the roles she played), but when I met her the eyes were filled with kindness. Meg Foster is an American actress. She was born in Reading, Pennsylvania on May 10th, 1948 and grew up in Connecticut, with her parents and 4 siblings (3 sisters and 1 brother). She studied acting at the “Neighborhood Playhouse School of the Theatre” in New York. TNP is a big player in American Theatre and Theatre Education. Among the alumni are: Gregory Peck, James Caan, Christopher Lloyd, Steve McQueen, Robert Duvall and like I said Meg Foster. Foster played in movies, like: The Osterman Weekend (1983),Masters of the Universe (1987), They Live (1988), Stepfather II (1989) Blind Fury (1989), The Man in the Iron Mask (1998), The Lords of Salem (2012) and most recently in 31 (2016). But she also played in a lot of series, like: The Six Million Dollar Man, Hawaii Five-o , Cagney & Lacey (Det. Cagney, first 6 episodes), The Twilight Zone, Miami Vice, The Cosby Show, Quantum Leap, ER, Star Trek: Deep Space Nine, Hercules, Xena: The Warrior Princess, Pretty Little Liars, Ravenswood and The Originals. Pretty impressive right? And there are many, many more! (Between 2000 and 2011 Meg took a break from acting and in these years she appeared in only a handful of productions). 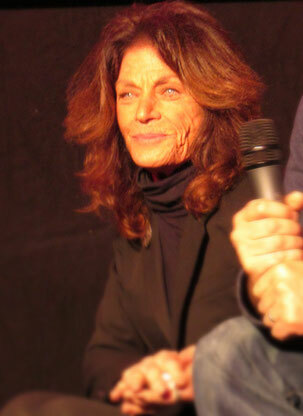 When Weekend of Hell announced the cast members of Rob Zombie’s 31, I saw Meg Foster was one of them. She has a very familiar face and I remembered her mostly from her role in Pretty Little Liars (where she plays Mrs. Grunwald). When I checked out IMDb I found out why she looked so familiar, because she has an impressive filmography and she played guest roles in a lot of series I used to watch. As a preparation for Weekend of Hell I put 31 and They Live on my watch list and by the time we went to Weekend of Hell, I felt very drawn to meeting this interesting actress. After this Meg seemed to be very emotional and it was at that moment I knew I wanted to meet her. We had some presents (stroopwafels and drop) for the actors and I knew I just wanted to give her a present. I just wanted to have a talk with her. 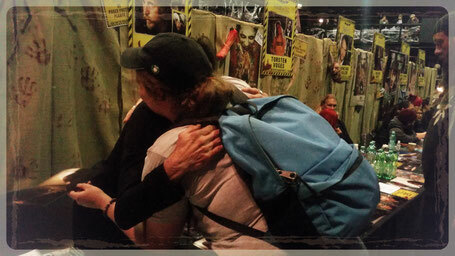 When Meg got back to her table I took my chance and I walked up to her. I gave her the candy I had for her and she was so grateful. We talked about Dexter (I had my Dexter shirt on), Pretty Little Liars, Ravenswood and 31. She talked about the young actors in Pretty Little Liars and Ravenswood and about how talented she thought they are. And what a pity it was that Ravenswood was cancelled. After a while she said: “I want to give you an autograph” and I was pretty overwhelmed. I said that I gladly wanted to pay for it, but she said: “Look into my eyes, I want to GIVE it to you”. She signed the picture I chose and after this I told her again that I just wanted to meet her and that I could pay for the autograph. And then she made me look into her eyes again. I asked her if I could give her a hug to thank her for this great moment and for the autograph and she answered that she just wanted to reach over the table to give me a hug. I thanked her again and she wished us a safe ride home. It was a great moment and I will never forget this for the rest of my life. 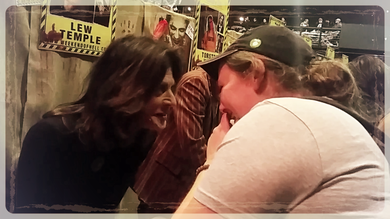 Meeting Meg Foster really was one of my best convention moments. They say that the eyes are the window to the soul and what a great soul she has! I hope I will get the chance to meet Meg again somewhere so I can tell her how happy she made me , but even if I don't I will cherish these great memories. Thank you Meg Foster, you are a great actress, but above all you are a wonderful human being..